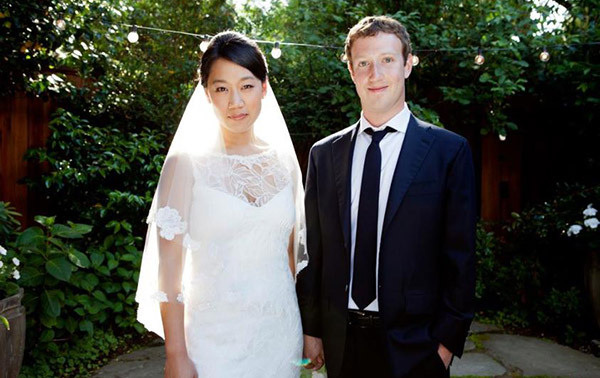 Congratulations to Mark Zuckerberg and Priscilla Chan on their recent wedding! Mark Zuckerberg does not have a track record of doing things the ‘traditional’ way so his surprise wedding ceremony seems to suit his style. Here is a post from mashable.com. In a surprise ceremony, Facebook CEO and founder Mark Zuckerberg married his longtime girlfriend, Priscilla Chan, in a private wedding at his home in Palo Alto, Calif. on Saturday. According to the Associated Press, Zuckerberg’s marriage to Priscilla Chan took place in front of about 100 invited guests who thought they were celebrating Ms. Chan’s medical school graduation. It all happened in Zuckerberg’s backyard. Take a look at Zuckerberg’s personal page on Facebook, and you’ll see the above picture, which Zuckerberg reportedly placed onto his own site as a change of his status after the ceremony. The couple met while both were attending Harvard, and have been together for nine years.